The cliff notes version is that due to the raised use in antibiotics for livestock, diseases like MRSA can spread from animal to human. The question is what do we do with this information. Rep. Louise Slaughter (D-N.Y.), who holds degrees in public health and microbiology, says “This study ends any debate. The extreme overuse of antibiotics in livestock is endangering human health.” The U.S. Center for Disease Control (CDC) continues to state that one of their top priorities is to control diseases like MRSA from spreading. It should be noted that Rep. Slaughter has reintroduced the “Preservation of Antibiotics for Medical Treatment Act” for the forth time in hopes that this new information will give the bill the traction it needs. What are your thoughts on the use of antibiotics in livestock? 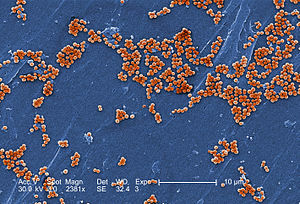 Do you think that limiting human exposure to antibiotics for routine infections (common cold) will help MRSA from adapting and spreading? Eco Applicators specializes in the professional application of a mineral based; light activated and eco friendly NanoTech™ antimicrobial surface spray. We help provide a solution to the ongoing battle of infection prevention and control. Our product is unique in that it is safe to humans, animals and the environment, effective in killing pathogens 24 hours a day, and durable expected surface life of over one year. This entry was tagged EMBO, Molecular Medicine Journal, NanoTech Spray, Prevention. Bookmark the permalink. ← This is How we Help Keep Athletes Healthy.